[Editor’s note: Happy Holidays! This week, the editorial team at Content Marketing Institute wanted to share some of the best content marketing blog posts we’ve seen from the CMI Online Training and Certification program’s roster of expert instructors. Today’s post originally appeared on Doug Kessler’s Velocity Partners blog on March 23, 2013. 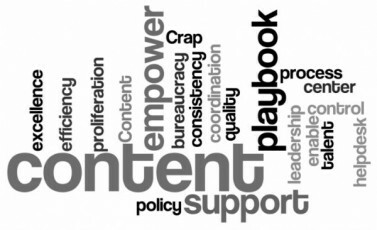 As we all move along the content marketing maturity curve together, the biggest companies are starting to hit a new problem: Lots and lots of different teams within your organization will be generating content for their own needs — without any coordination, orchestration, strategic validation, or quality control. It’s the age-old challenge — local relevance vs. central control — but it’s a fairly new issue for us content people, and it’s an increasingly important one. The problem is created by the power of content itself. Once people see it, everybody wants some. Different departments are making content: The product guys need some. The consultants need some. The press team needs some. It’s not just marketing; it’s sales, customer service, HR… anyone who needs to communicate messages. Different regions are making content: France saw what Latvia did and wants some of that mojo. EMEA is re-purposing Australia’s eBooks into videos. The U.S. team has woken up to all this and is throwing budget at the problem. Think about this: Content coming from every pore in your company. Lots and lots of eBooks, videos, white papers, web pages, microsites, Prezis, SlideShares, Pinterest boards, Facebook pages, LinkedIn groups, email newsletters… The underlying stories aren’t that different, but the packaging sure is. At Velocity, as we create content for our bigger clients, it’s not uncommon for us to trip over someone in a distant corner of the company who’s doing something very similar — or for them to trip over us. Either way, it’s embarrassing and preventable. Big companies need more process, infrastructure, strategy, and structure than smaller companies. Ironically, these extra structures are there to help Goliath behave more like David. In practice, they often do the exact opposite. The trick is to have an enlightened center, instead of a dead hand. But if you’re still small, you don’t really need to worry about these things. Go read something inspiring like the B2B Marketing Manifesto or the Three Poisonous Metaphors in B2B Marketing, or Pnin. Confused prospects and customers who aren’t sure what to consume, where to go for it, and how it relates to all that other content they’ve seen coming from your company. The HQ vs. Regions (or C-Suite vs. Line-of-Business) tension shapes almost every discipline in global companies. It’s the problem that gave us Brand Police, Compliance Cops, and The Worldwide Heads of Sameness. We call this the Center of Content Excellence (or the Content Center of Excellence, if you prefer) and we’re convinced it’s the only way forward for big companies who want to harness the power of content but don’t want to waste a fortune on ill-conceived, poorly executed effluent. Content expertise: The best content people in the organization should sit here. Business chops: The CCE must understand the entire business, the market, the customers, the products and the competitors. Access to the top: The Center has to know the company’s content strategy now, and where it’s going next; and it has to sell a content culture to the top team. Flexibility: Content is an incredibly diverse discipline; a cookie-cutter approach will kill it stone dead. A hunger for new things: Content media and tactics are changing all the time; the CCE must lead the company by experimenting with everything that looks promising. An affinity for openness: We live in social times; today’s companies are porous; the CCE should help the organization embrace this instead of fighting it. Clearly, it takes a special kind of person to build and run a Center of Content Excellence. You need to be confident enough to be relaxed about your ultimate lack of control. You need to be smart and likable so you can attract people to the light instead of herding them there. And you need some power. Who’s in the Center of Content Excellence? It starts with a Chief Content Officer, whose job it is to win executive backing, build the team, set the policies and processes, and orchestrate the whole thing. That’s a lot of hats, but it doesn’t have to mean a lot of heads. The very best people combine several talents — and you need the very best in the Center of Excellence (or it will become the “Center of Mediocrity” and will kill the “Goose that Ought to Be Laying Golden Eggs but Instead Is Just Eating and Pooping”). Done well, it will be one of the best pieces of content in your business. Smart, fun, enlightening, and entertaining. Your primary goal is to build a great content brand: A brand known for producing fantastic stuff. Our ‘Crap’ SlideShare explains why. Great content is more likely if there’s a sound strategy: A shared understanding of goals, target audience, themes… See our Big Fat Content Strategy Checklist for help. Know your target audience: We don’t really like the word personas, but we do really like the idea behind it, as this round-up and this post explain. Great content is insanely ambitious: Creating a content machine can kill this; aim for “the best content on the web for this topic” and you just might hit it. Different perspectives are more interesting: A centralized content resource shouldn’t lose the variety that makes life interesting. Don’t forget the F word: If a piece of content was fun to make, it will be fun to consume; and we all like fun. Are you struggling to add any kind of centralized coordination or quality control?